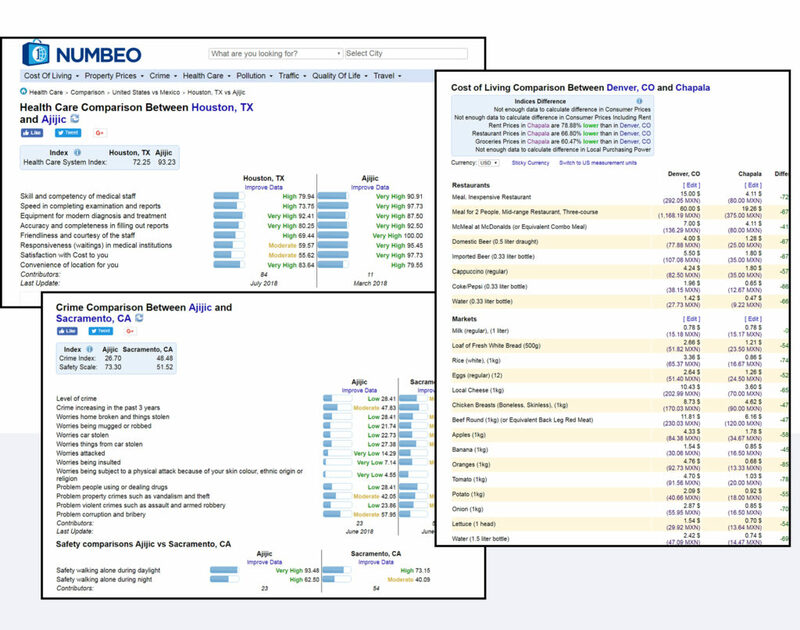 If you are wanting to compare fundamental costs, statistics and services between almost any two places in the world, then the amazing https://www.numbeo.com/ web site is for you! Info for any individual place can be viewed. The example above shows property prices in Ajijic. 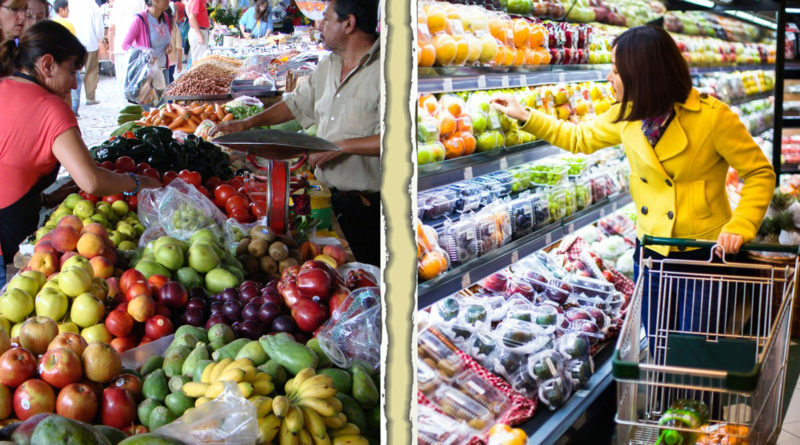 For example, let’s say you want to view or compare prices in Ajijic and those in your home town — wherever that may be. Numbeo will provide you with current and timely information on such things as cost of living, real estate prices, crime, health care, pollution and much more in both places. It will even calculate your vehicle’s fuel costs based on local gas prices and distances between cities. And, you can select the currency or measurements you prefer. 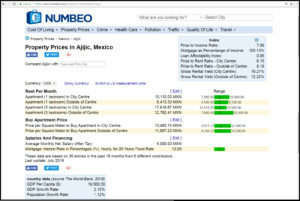 Numbeo is the world’s largest database of user contributed data about cities and countries worldwide. It includes 4,448,763 prices in 8,398 cities entered by 356,943 contributors. Data at Numbeo.com are not influenced by any governmental organization. Instead, the structure of the site allows anyone with an Internet connection to contribute firsthand information to its content. A wide variety of data comparisons, such as those shown above, can be made between two places. Numbeo has been mentioned or used as a source by many international newspapers and magazines including BBC, Time, Forbes, The Economist, Business Insider, San Francisco Chronicle, New York Times, The Telegraph, The Washington Post, USA Today and dozens more. When visiting the site, you will be invited to become a member of the Numbeo community (it is free), and contribute information if desired. Members will periodically receive a newsletter from Numbeo.